Deepika didn’t know the significance of maintaining good dental hygiene in children until her 3 – year old toddler Ishaan started showing signs of a dental cavity. She noticed some white spots at the gum line of his upper-front teeth one day. She wasn’t sure what it was and decided to consult Dr. Bindiya Bansal, Consultant, Dentistry at Sitaram Bhartia Hospital. Deepika asked how it was possible for her son to have a dental cavity when he was only three years old. “These days early childhood dental caries are the number one chronic disease affecting young children,” remarked Dr. Bindiya. What causes dental caries in toddlers? The main reason children develop dental caries is because of the presence of high quantities of sugar in food and poor eating habits. “Dental caries is an infectious disease caused by the cariogenic bacteria. This is a type of bacteria that lives in your mouth, sticks to the film of your teeth and feeds on what you eat or drink (especially sugars). As it digests your food, it starts making acids which break down the tooth’s outer surface and drains it of essential minerals leading to a painful cavity,” explained Dr. Bindiya. When children have a habit of snacking frequently and sleeping with a bottle full of milk or juice in their mouths, the sugar in the food sticks to their teeth for a long time. The bacteria in their mouths thrives on that sugar and causes dental cavity. Deepika felt guilty as she recalled times when she allowed Ishaan to sleep with his milk bottle in his mouth. She remembered how she never bothered to ensure her son’s dental hygiene because she thought he was too young. “Ishaan is just three-years old. How do infants get this bacteria in such at such a young age?” Deepika asked, confused. Babies are not born with this decay-causing bacteria but are often infected with it from their primary caregiver, mostly their mother. “The bacteria travels to the baby’s mouth when adults share their spoons, cups and other utensils with him. This is why you should refrain from sharing your eating utensils with your baby and also frequently visit the dentist to ensure your dental health,” advised Dr. Bindiya. This was the next question Deepika asked the doctor because she was worried that the dental cavity will disrupt the whole structure of the teeth. Other than that, decay in baby teeth can be an extreme source of pain. It affects the general well-being of the child. 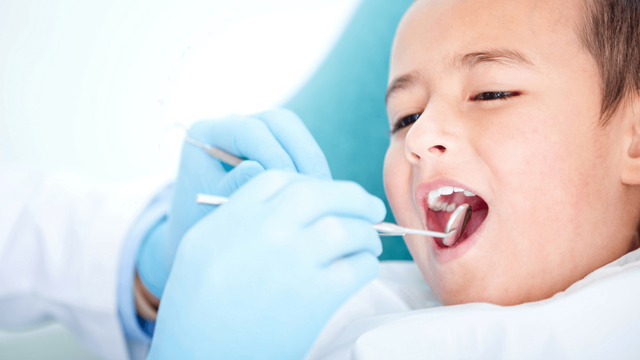 What should be the treatment for dental caries in children? Since Deepika noticed the signs of dental cavity in her son’s tooth early and brought him for treatment, the damage done to the tooth was not that severe. Dr. Bindiya suggested a fluoride treatment which will help remineralize his tooth and reverse the decay by rebuilding the surface enamel. Thankfully, Ishaan was perfectly fine after the treatment and his tooth started to recover in no time. Deepika didn’t want her son to develop tooth decay again so she eagerly enquired about what she could do to prevent dental cavities in future. “Dental caries in children are preventable if you take the right steps to ensure your child’s dental hygiene,” said Dr. Bindiya. Don’t hesitate to start early – Begin cleaning your infant’s mouth within the first few days of birth by wiping his gums with a clean and soft washcloth. Brush your child’s teeth regularly – You can start brushing your child’s teeth gently after his first set of teeth starts appearing. You can use a baby tooth brush. Brushing twice daily is considered a good practice. Avoid giving juices and soft drinks as they have more sugar which can increase the chances of tooth decay. Inculcate good eating and drinking habits in your child – Make sure that your child finishes his bedtime bottle way before sleeping. Don’t let him fall asleep with the bottle inside his mouth. Ensure your dental health as well – Your dental hygiene is equally important, so make it a point to visit the dentist regularly to maintain your dental health. Your child will be prone to tooth decay if you suffer from it. Be the right example for your child. Minimize night time feeding after your child turns 1 – Bed-time feeding encourages the formation of dental cavities. Also, discourage bottle feeding after 2 years of age. “Remember that introducing a child to good oral hygiene early can lead to a lifetime of good dental health,” advised Dr. Bindiya.